1. 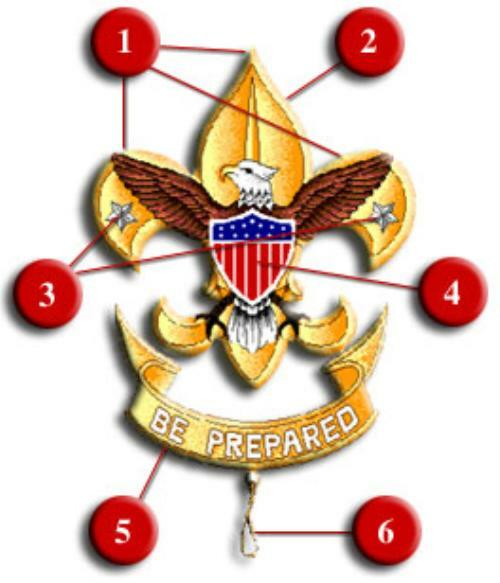 The three-point design of the badge is like the north point of the old sailor's compass.The main part of the badge shows that a Scout is able to point the right way in life as truly as the compass points it in the field. 4. The eagle with the shield is the national emblem of the United States of America. It stands for freedom and a readiness to defend that freedom. 5. The scroll with the Scout motto is turned up at the ends to suggest the corners of a Scout's mouth raised in a smile as he does his duty cheerfully. 6. The knot attached to the bottom of the scroll is to remind you that, as a Boy Scout, you promise to be helpful and to do a Good Turn for someone every day. Why Do Scouts Wear Uniforms? Scouting material at one of these two Council Scout Shop locations in or near Three Fires Council. The friendly Scout Shop staff is ready to assist you in selecting uniforms, badges, camping gear, and activity, and recognition items. Click Here to visit the Council Scout Shop online for valuable coupons and specials, schedule of hours, and other information. The Dollar Store in downtown Sycamore on W. State Street (Rte 64)(between Somonauk St & California St). They carry most uniform parts. Cash Only. 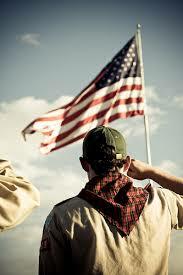 As a military custom, the flag is lowered daily at the last note of retreat. Special care should be taken that no part of the flag touches the ground. The Flag is then carefully folded into the shape of a tri-cornered hat, emblematic of the hats worn by colonial soldiers during the war for Independence. In the folding, the red and white stripes are finally wrapped into the blue, as the light of day vanishes into the darkness of night. "For these [difficulties] I have found that a smile and a stick will carry you through all right, and in ninety-nine cases out of a hundred it is the smile that does the trick." "When next you are worried or angry, force yourself to turn up the corners of your mouth and smile-and you will find the value of this tip." ". . . the Devil is best described by the term " Selfulness."" "In a difficult situation one never-failing guide is to ask yourself: "What would Christ have done?" Then do it-as nearly as you can." "This world that we're a' livin' in Is mighty hard to beat: Of course there's thorns in every rose, But ain't the roses sweet !" "A thing that many young fellows don't seem to realism at first is that success depends on oneself and not on a kindly fate, nor on the interest of powerful friends." "Varied are the ideas of what constitutes "success," e.g. money, position, power, achievement, honours, and the like. But these are not open to every man-nor do they bring what is real success, namely, happiness." As Sir Henry Newbolt sums it up: "The real test of success is whether a life has been a happy one and a happy giving one." "Almost any biography will have its useful suggestions for making life a success, but none better or more unfailing than the biography of Christ." "Your natural inclination is to preach and to warn other travellers of snags in the path, but isn't it better to signal to them some of the joys by the way which they might otherwise miss?" "You can only get discipline in the mass by discipline in the individual." "Leave this world a little better than you found it." Many from: Lessons from the Varsity of Life was written in 1933 when B-P was 76 years old. It is his longest autobiographical work.